A double tower climbing frame from Play Crazy is a jam-packed playset with plenty of play space and fun activities to keep kids amused. The Double Tower is a relatively space-filling play frame designed with medium to large sized gardens in mind. Play Crazy also offer a wide range of climbing frames to suit smaller and larger gardens, including the Single Tower and Triple Tower climbing fram es. 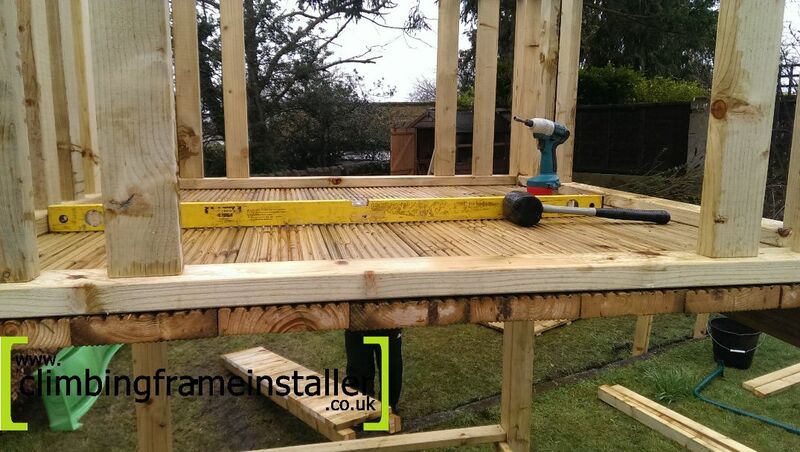 One good thing about wooden play frames from Play Crazy is that they can be concreted into the ground to maximise their stability, as opposed to standing on top of a safety surface or grass. Being concreted into the ground increases the stability and security of the play frame making Play Crazy climbing frames safe to play on. The Double Tower playset featured here includes two robust wooden play towers joined together by a footbridge, plus a swing set and plenty of other accessories to keep boredom at bay. 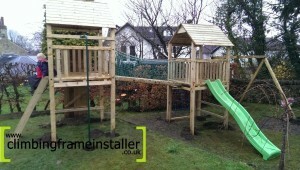 The first play tower features a spacious play deck for children to climb to plus a wooden roof which covers the fort. The roof provides shelter inside the play fort as it helps keep precipitation and direct sunlight out so kids can pla y happily inside the play tower. 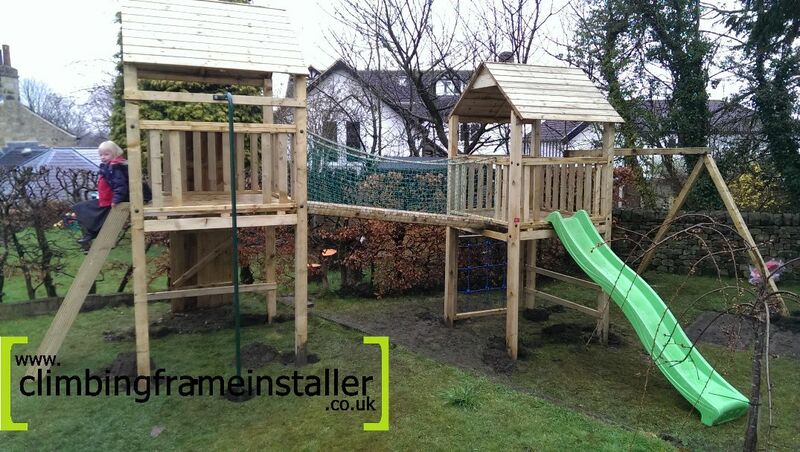 Kids can climb to the play deck using either the step ladder at the side of the climbing frame, or the rockwall at the back of the first play tower. The rockwall presents a more challenging climb to the deck which will test children’s coordination and balance, so is fantastic for keeping older children and confident climbers amused. The step ladder is a good alternative way for little ones to climb to the play deck safely as it provides a les s challenging route. 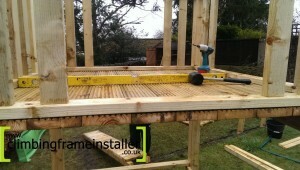 The play deck is enclosed by wooden railings around the outside therefore helping to keep little ones safe while playing. 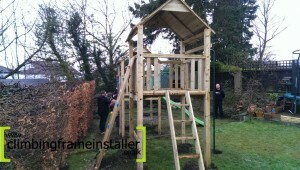 The first play tower even includes a fireman’s pole at the front of the play frame as a fun way for children to exit the play deck and get back to the ground. The bridge which joins the two towers is a wooden bridge and it is enclosed either side by safety netting so kids can run from one play tower to the other safely. The second play tower has the sam e design as the first with a wooden roof over the top of the fort and a second play deck for children to climb to. Both play decks have ample room for several children to play at once and little ones can climb to the second tower’s deck by using the cargo net at the back of the tower, or going across the bridge from the first play tower. The cargo net is a fun accessory which is a popular climbing frame feature and it is a great way for kids to develop and practice their climbing and balancing skills. It is a more challenging accessory than the step ladder also, so will give less confident climbers something to grow into. The second play tower also features a slide at the front of the climbing frame which is a very popular playset accessory too. The slide offers a fun way for children to exit the play deck and can provide hours of entertainment. 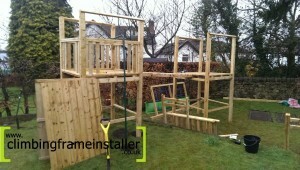 This Double Tower climbing frame includes a swing set adjoined to the second play tower which gi ves kids even more ways to keep them from getting bored. A swing set is a brilliant way of keeping kids amused and adds to the fun factor of a Double Tower climbing frame from Play Crazy. Climbing frames are a great way for children to get plenty of exercise and stay active. 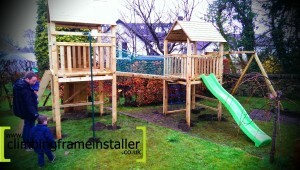 Garden playsets are a good investment for your family and garden offering plenty of outdoor fun for the whole family. 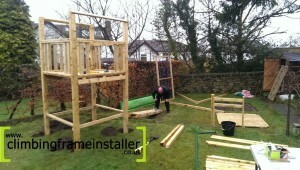 For help with installing your playset contact the climbing frame installers today. 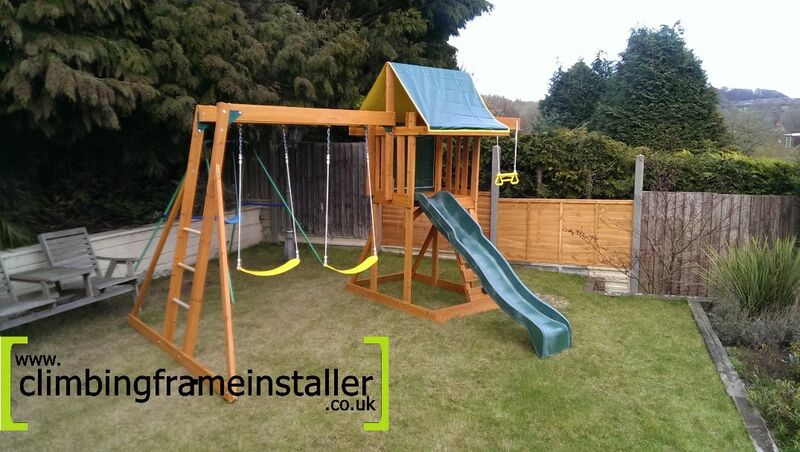 Our experienced team of climbing frame builders can offer a professional yet affordable installation service to ensure your play frame is correctly and safely installed.